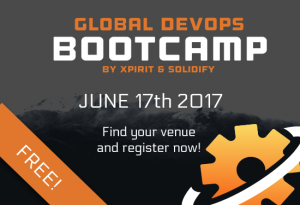 On June 17th we (Marcel de Vries, René van Osnabrugge and Mathias Olausson) are organizing the first Global DevOps Bootcamp! With local events happening all over the world we create a global event where communities passionate about DevOps on the Microsoft stack can come together, learn about the latest trends and share their experiences. We want to create a 1-day event together with other communities all around the world. The agenda is simple. We start with a kick-off (on video) of no one less than Donovan Brown. Then, your local partner will deliver a full fledged keynote around DevOps and where we are heading. The rest of the day we will get our hands dirty and do a hackathon to move an existing application towards a serverless/containerized solution with all DevOps practices in place ! We are kindly sponsored by Xpirit, Solidify and Microsoft and there are a number of local partners already organizing the bootcamp on location. If you want to join (and you do want to J) follow these easy steps. Find your local venue on the Global DevOps Bootcamp website, or search for Global DevOps Bootcamp on EventBrite. It is free ! If you want to be an organizer or a sponsor, reach out to us and we get you hooked up.